Mathematics can be found everywhere. For our literary analysis, we decided to look at the application of the friends and strangers theory and Ramsey's Theory. These can be used to understand the probability of the transplanted kidney surviving in its new host. In our art analysis, we researched minimal surfaces and how they are differentiated from the inefficient surfaces drawn in the picture. We connected this to the way that the body recognizes foreign tissue after a transplant. For our research analysis, we connected the data to probability, and determined possible outcomes of a patient based on Punnett squares and heredity. Though kidneys may not appear to be an interesting part of the body, mathematically they can be quite interesting. We hope you enjoy reading our conclusions as much as we enjoyed developing them. The New Kidney in Town by Mia Licciardi is a short narrative of a kidney's adventure from a body that is dying in a car crash to its transplant into the body of a young female child. It is not until the kidney is actually transplanted that the adventure begins. Is the kidney a "good enough" match to survive the onslaught attack from the girl's natural immune system? It is the "good enough" match that ultimately determines whether the girl lives or dies. How good the match has to be can be likened to a few different math theories that deal with probability and likelihood of events happening. The first theory is based on the math problem of "Friends and Strangers." This classic problem begins by suggesting that 6 people are randomly meeting. It can be assumed that no one person is "friends" with all of the other five nor are they "strangers" to all of the other five. If each person is friends with some of the others and strangers to the remaining people, then it follows that either 3 of these people were friends before they entered the room or three people were complete strangers when they entered the room. One of these two possibilities must exist. This is often referred to as Ramsey's Theory. See Figure 1, where red lines indicate that the people are strangers and the blue lines indicate the people are friends. In this example, a red triangle exists between C, E, and F; that means that those three people were strangers to begin with. To remove this triangle - eliminating the possibility that three people were strangers - would mean turning one of the edges from red to blue. Any such change would create a triangle of blue - meaning that there were three friends beforehand. Changing line FC to blue creates a blue triangle ACF. Changing either line EF or line CE to blue creates blue triangles DEF and CDE respectively. Any coloring of these lines with only two colors necessitates the creation of a triangle of one color or the other. In Figure 1, an example of Ramsey's Theory can be seen. "A" represents the person who needs the kidney. The other letters, "B" through "F," represent the other factors that affect whether the kidney will function in the new body or not. These factors include HIV, CMV, HCV and HSV and other genetic profiles, respectively. To interpret this diagram, we assume that the blue line means that the interaction does not affect the kidney negatively. The only lines that matter under this interpretation are the ones connected to "A." The ideal situation would be that all the lines to "A" were blue - meaning none of the factors adversely impacted the donor-kidney compatibility. But Ramsey's Theory rules out this specific case. So, we consider other cases and imagine that blue lines between characteristics (HIV, CMV, etc.) imply supporting compatibility and red lines imply conflicting factors. Thus, in our imagining of these circumstances, a blue triangle that has "A" as a vertex is more desirable than two blue lines from "A" that are connected with a red line. With this interpretation, we can apply Ramsey's Theory. from the figure contains all red lines, then the match is not good enough. If there exists a blue triangle, then this is a good match. The likelihood of getting a blue triangle depends upon the initial setup of the problem. As additional factors that affect the rejection of a transplanted kidney are discovered, the Ramsey's Theory can still be applied. The shape, as seen in Figure 1, is not limited to only 6 factors. The number of interactions can be increased and analyzed in a similar fashion. transplants, such as a transplant from a sibling or parent. As can be seen in Figure 2, when a parent transplant occurs, the kidney is expected to function properly in the new body for 12 years. It is only when there is an exact match of HLA-loci, which is genetic matching, from a sibling, that the effective life of the kidney increase significantly from a low of 9 years to a high of 22 years. If Ramsey's Theory is applied to the data from Figure 2, and groups of 6 were formed, then there would be 14,500 figures similar to Figure 1 generated to represent all cadaver transplants. Each of these figures would have the chance of either having two perfect matches or two perfect mismatches. The combination of red and blue-sided triangle would represent the possibility of having some of the needed genetic matches but not enough to be considered a "perfect" match. Ramsey's Theory helps portray why so many transplants are performed using cadaver kidneys because of the increased number of transplants that could be performed, while also explaining why the survival rate is lower than the other types of transplants. The odds of a child's new kidney functioning properly after the transplant are significantly lower than that of an adult's. Figure 3 shows the number of transplants performed each year for every age group by The Kidney Transplant Program at Children's Hospital Boston. There were only 43 out of the 623 transplants, 6.9%, performed on children, up through age 10. This low number could be the result of the low availability of kidneys for children. In the story, the child was receiving a kidney from someone who had died in a car accident. It was not apparent whether the kidney was also from another child or she had received an adult kidney. However, being a child there is a lower probability for a child to receive a kidney transplant. A second probability problem that can be applied to this short story is the Monty Hall problem. Monty Hall hosted a game show, called "Let's Make a Deal," where the contestant was given three doors to choose from. For example, one door contained a car and the other two contained goats. The contestant got to choose a door. Before the door was opened, they were shown where one goat was by opening a door, and then given the opportunity to switch to the other door. 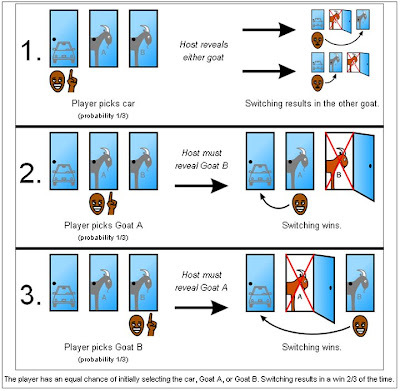 Bayes' Theorem shows that there is an increased probability of winning if in fact the contestant switches doors. The actual probability of winning when the contestant doesn't change doors is 1/3.Whereas the probability of winning increases to 2/3 if the contestant switches their choice. Therefore one should always switch to increase their probability of winning. This would be a humorous twist if this were applied to the kidney transplant problem. What if the young girl was given three kidneys to choose from? One is a perfect match and the other two are not. Her doctor asks her, "Which kidney do you want?" She chooses the kidney in cooler #2. The doctor then opens cooler #3 and shows her that it is not a perfect match. He then asks if she wants to switch her choice to cooler #1. If the young girl doesn't change her choice, she has a 1/3 chance of selecting the "perfect" kidney. If she switches her choice, she increases her odds of selecting the "perfect" kidney to 2/3. Figure 5 verifies these odds, showing the results over 300 trials. Although a significant amount of scientific research has been compiled to properly match donors and recipients of transplants, simple probability still plays a role in deciding whether the chosen organ will be effective or not. We chose the art piece titled Waiting on Fate by Janey Eager. This piece depicts Pilot, an allegorical kidney, who is mistaken by the creatures of the world Transplantia for a foreign enemy. A central part of the piece is the bubble that Pilot is staring at. A bubble is an example of a minimal space surface, found often in nature. Nature, in the interest of conserving energy, will select the shape that requires the least amount of energy to maintain. Also, it can enclose a certain volume in as little surface area as possible, another example of nature's desire to conserve energy. Joseph Antoine Ferdinand Plateau did a lot of work with minimal surfaces. His research was geared towards finding the shape of minimal surfaces. Today, it is known as Plateau's problem. Plateau observed the way soap films clung to wires. The soap film fills its boundary, the wire, in as little area as possible; therefore it is a solution to Plateau's problem. For example, if a wire cube is covered with soap film, which inverts in on itself, equalizing the gases inside of it with the gases outside by introverting inside the cube to enclose the wires in as little space as possible. The pressure of the competing gases helps the bubble to form and maintain its shape (see Figure 6). Without that pressure, the formation of the cubic bubble would not be possible. Plateau also did work with double bubbles and multiple bubbles, but the most efficient form of a minimal space surface is the single bubble. area could. The fact that the bubble is so starkly different than the other creatures within the world of Transplantia sends a signal to these creatures that Pilot is a foreign body. The artist's interpretation can then be tied to Ms. Perez's research on transplants. The body, much like the creatures, can recognize foreign tissue that has been transplanted. Towards the back of the picture is a spine-like object. The spine contains central nerves that carry signals fromthe body to the brain. The creatures of Transplantia, therefore, could communicate with each other through this spine, and send signals to each other of Pilot's presence. They believe that Pilot is a threat to their town. This is similar to the body's ability to recognize foreign tissue, and Pilot's fight to stay alive in Transplantia is symbolic of the difficulties transplanted tissue undergoes in a new host. Leat Perez's research deals with BK viruses, killer immunoglobulin-like receptor genes in Chromosome 19, HLA glands, and if these things influence infection with kidney transplants. In laymen's terms, will the transplanted kidney work in the other human's body? Before we get into the specifics, the background of immunology is very important to understand when dealing with the connection of math with Perez's research. Immunology deals with how well one's body responds to foreignness such as a new kidney. In order for a transplant to have a chance to work, the Human Leukocyte Antigen (HLA) is matched. HLA is a fancy way of describing proteins that contain a large amount of genes associated with a specific person's immune functions. The necessity to find the closest match of HLA is because there is a chance that the patient's immune system will view the donor's HLA as an invader and kill the kidney. The closer the match, the greater the chances the kidney will survive. In Punnett squares, the genes of the parents are crossed to predict the outcome of the offspring.In Punnett Square 1, 100% of the offspring will have a dominant trait of HLA. This is because the dominant trait prevails over the recessive, resulting in all the offspring having a dominant HLA. As for when one crosses dominant with recessive, the outcomes will be as follows: 25% of offspring will be fully dominant, 50% will be dominant recessive, and 25% will be recessive. One can conclude with Punnett Square 2 that 75% of the offspring will have a dominant HLA and 25% will have a recessive HLA. These four combine to yield exactly 16 types of KIR cells. As one may find, math is found in our everyday lives. Math helps us understand the world better and offers a way to prove and back up our findings. In Perez's research, math can be someone's best possibility to survive - matching kidneys using math expressions. Mia Licciardi "The New Kidney in Town"